The Citizen CLP8301 is a first-class, wide format printer specially designed for demanding applications that require medium and large format labels. It produces labels and tickets using either the direct thermal or thermal transfer printing process. Its powerful 32-bit system architecture and a high speed of 102 mm per second with 12 dots/mm 300 dpi help the CLP8301 create extremely complex label formats in no time. Maximum printing speed 102 mm/sec. This high-performance printer not only excels with features and a label width of 228 mm, it establishes new standards in user-friendliness and reliability. Roll sizes up to 203 mm prevent interruptions for changing media, while the side window indicates the current consumption level to the user. In order to exchange the label roll or ink ribbon, the user simply opens the entire lid and replaces consumables easily with the help of colour-coded instructions. 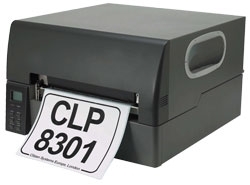 Like all Citizen label printers, the CLP8301 is also equipped with ARCP technology. This ensures continuous ink ribbon use without wrinkling or failures and also leads to better results, which is especially important with large printing widths. Users change the printer configuration within seconds using the clearly readable LCD panel. Menus and categories are logically grouped, making fast changes during print operations possible. The CLP8301 is equipped with a standard parallel and a serial RS232C interface with up to 115,200 bit/s. Optionally, you can individualise the printers for customer demands with a high-speed parallel IEEE 1284 interface, Ethernet networking or USB interface module. For full compatibility with existing customer systems, the printer is equipped with industry standard software emulation that allows the use of many different software kits. Also available for easy retrofitting a cutter and a dispenser edge for extra efficient and ergonomic production.